Cantina Giardino was born as a winery in 2003 to “save old vines”…that was their focus. Old vines…50 year old and up…and old original clones and traditional training system called Raggiera Tipica Avellinese similar to the Pergola system. Currently Cantina Giardino is the only winery in Campania that only uses the Raggiera Tipica…..other wineries use the more productive GUYOT or SPALLIERA. This old system produces less fruit, more flavor, more acid and less alcohol. is not used during fermentation and it’s not used at bottling. 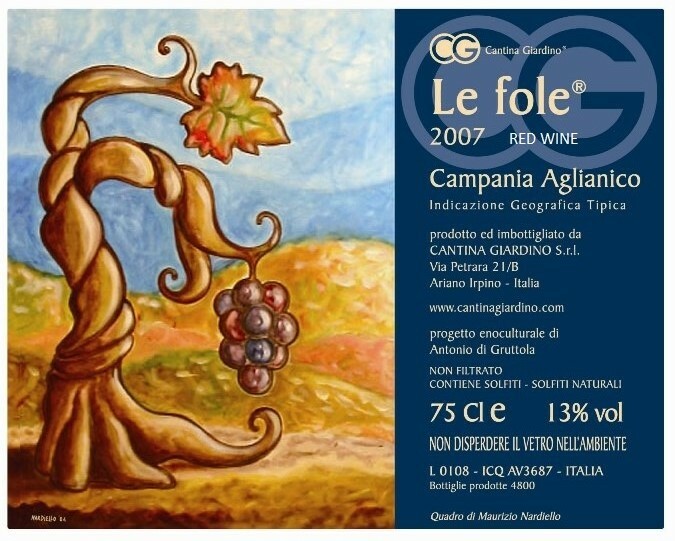 LE FOLE which means the fairy tales goes through 30 days of maceration…..1 year in large chestnut botti…..1 year in the bottle. The flysh soils are of volcanic origin.